Rwanda FTO Dukunde Kawa Musasa Mblima is sourced from family owned farms organized around the Musasa mill located near a gorilla habitat in the Gakenke district of Rwanda. Farm plots are so small that measurements are based on the numbers of trees, not area of land. 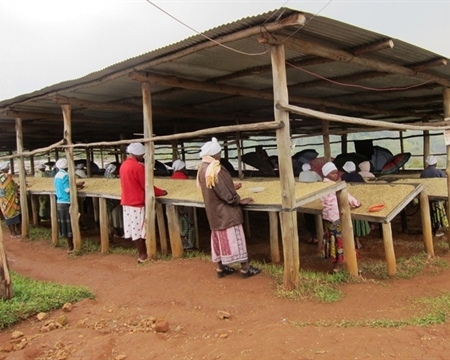 Farmers who process their coffee at the Musasa mill are members of the Dukunde Kawa Cooperative, which started in 2000 with enough funds to build one wet mill. 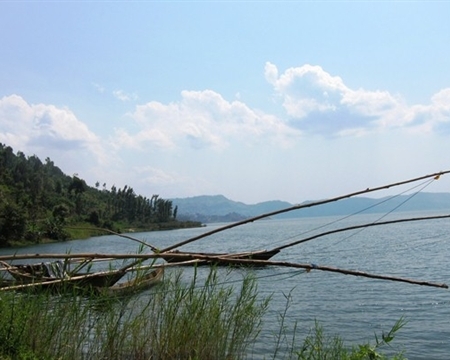 In the following years, the Dukunde Kawa Cooperative has built three more wet mills and completed construction of their own dry mill. More than 80 percent of the cooperative workforce is women, and producer-members have used earnings to improve their standards of living with investments in livestock, access to healthcare, and programs to protect the environment. Medium bodied and clean; very chocolaty cup profile with some nice citrus floral overtones. Lighter roasts will have strong citrus and floral aspects, a bit too much for most unless you love a sizzling cup. Medium roasts get very balanced, hints of floral and citrus fruit with a smooth and rich chocolaty undertone. Dark roasts get much fuller bodied with stronger bakers chocolate and smoke. If you go between a city and full city roast, one gets a nice brown sugar like tone while the cup is super hot, as it cools the chocolate note pops out above the citrus tones. Good at almost any roast, light roasts will be higher acidity so err darker rather than lighter if you do not like a bright cup. When roasting Africans (this guy included) they will look a shade darker than they are, a sheen gets on the surface at a nice medium roast.